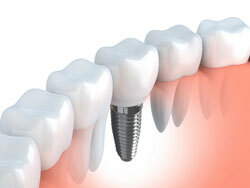 Dental implants can accumulate plaque and tarter just like teeth. As with natural teeth, it is important to that you clean these implant-supported restorations at home regularly with toothbrushes, floss and any other recommended aids. Dental implants can accumulate plaque and tarter just like teeth, making it necessary to maintain a regular professional cleaning schedule.